The best way to see the countryside with such places as Byron Bay and the Hunter Vallery is with a campervan rental from Sydney. A campervan rental from Sydney can be booked to go oneway or return with dropoff locations in Melbourne, Brisbane, Cairns, Hobart. Adelaide with starting minimum rentals of 7 days. Sydney campervan hire is a easy and cheap way to travel around New South Wales. 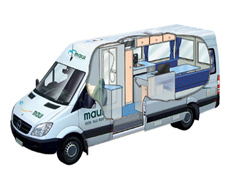 Campervan rentals depots are usually within 20 minutes by taxi to the airport . Australia boosts some of the best tourist van parks for campervans and RV's in the world just look at BIG4 Holiday Parks in New South Wales, NSW . The beaches of new South Wales are stunning from North to south of Sydney. Sydney Harbour is best known for it's world renowned icons such as the Harbour Bridge, Opera House, and Bondi Beach. Sydney is often referred to as the the gateway travel Australia. A self drive campervan or motorhome can navigate around Sydney Harbour which is beaming with ferries and yachts. Sydney Harbour is where one immerses yourself in Sydney's beach lifestyle. Bondi Beach | Drive up in a luxury Sydney motorhome hire and park at Bondi beach where backpackers to the rich and famous gather, take to the beach of this wide, one-kilometre long city beach. Enjoy a walk, bike ride, a jog, or just soak up the brilliant rays of the sun. Bondi Beach is 10 kilometres from the city centre. All year round community art shows to city to surf running marathons. Namadgi National Park | Explore Namadgi National Park situated in the Australian Alps - enjoy the silence of the bushland and Aboriginal history. A short self drive in your Sydney motorhome hire being just a 45 minute drive from Canberra. Bushwalk into the surrounding wilderness. Explore in a luxury RV or as we say motorhome. Yes you can hire luxury motorhomes to and from Sydney. Smaller motorhome hire and camervan rental options return or oneway from Alice Springs, Adelaide, Brisbane, *Broome, Cairns, Darwin, *Hobart, Melboune, Perth, Sydney in Australia. (Selected motorhomes). Smaller luxury campers for rental and hire in Australia with main aircon, cooker, toilet and shower. The Venturer is a fantastic option for the couple who want to travel in comfort. With its flexible and spacious bed configurations, Exterior slide out BBQ, LCD and DVD player, and toilet and shower facilities on board it a true home away from home. 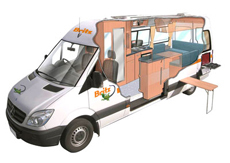 Smaller campers for rental and hire in Australia with cooker. Wow! This 4 berth campervan is great if you have four people travelling, but don�t need a toilet and shower. Very light and airy with huge beds and packed with features to make your journey a safe and comfortable one! 2 to 4 Berth 4wd camper rentals across Australia - 4WD campervan is ideal for thrill seeking couples or small families. Options with indoor and outdoor cooking facilities allows you to enjoy a dinner under the stars or in the cosy camper. Our unique car options include 4x4 car hir in Australia with 32L fridge | 4wd car hire with roof racks | 4wd car hire with tent hire | 4wd car hire with snorkel | 4wd car hire for 5 adults | 4wd car hire that let you travel on the Gibb River Road, Mereenie Loop and much more (see terms). 4wd + camping gear hire. Go wild in this true outback 4WD camper. This 5 berth camper has a cleverly designed slide-out kitchen unit plus a large tent, awning, camping stools, ratchet straps and roof rack, you will be King or Queen of the off-road!